To achieve lasting change, we must first understand the population of families that are working hard but falling short in each of our communities and across Florida. 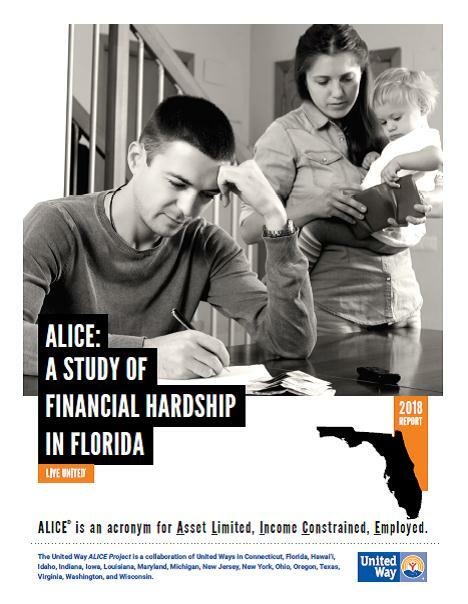 We commissioned the United Way ALICE Report to better understand this challenged and often overlooked population and provide each local United Way with data to promote stronger and more resilient communities. Local United Ways have long worked with the ALICE population in the areas of education, income and health to build better lives. The Report clarifies and describes the complex challenges they face and provides invaluable insight regarding how to promote policies and programs that benefit everyone. United Way ALICE Reports have been released in more than a dozen states, which can be found here. To access the national ALICE website, click here. If you would like to connect with your local United Way to learn what they are doing to use the Report or you would like to use the Report in your community, please click here. For questions, suggestions or opportunities that are regional or statewide, please contact Ted Granger at tgranger@uwof.org or 850-488-8276.